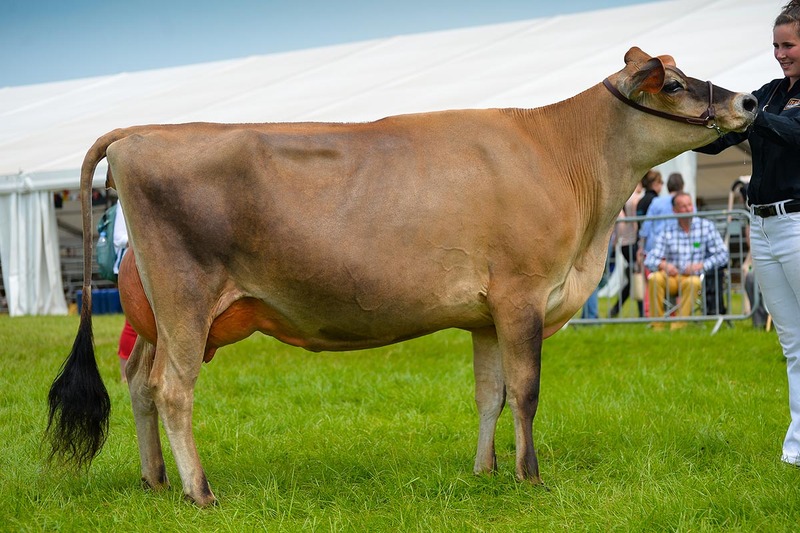 While temperatures remained high at the Royal Cheshire Show, there was much heat in the dairy rings as a Jersey heifer came out on top. Laura Bowyer reports. Dairy supreme champion, Rapid Bay-UK Jades Belladonna from James and Nicky Hudson and Beth Ford. After complimenting all dairy exhibitors for turning out their cattle so well in such hot conditions, inter-breed judge Alan Timbrell, Gloucestershire tapped out his supreme champion as Jersey heifer Rapidbay UK Jades Belladonna from James and Nicky Hudson and Beth Ford, Brindley, shortly after naming it inter-breed heifer champion. Having calved in November, it is now giving 22kg and is part of the brother and sister team’s 12-head of Jerseys which they run alongside their 250 Holsteins. By Belles Jade, it was out of Rapidbay UK Comerica Belladonna which was owned in partnership with James Strachan, Suffolk until the Rapidbay UK dispersal sale last May. Also winning the heifer class at the last UK Dairy Expo, the young Jersey will next be seen at Newport, Anglesey and Nantwich shows. Riverdane Ex Rosabel from Mark and Sue Knutsford of Riverdane Holsteins, took reserve dairy supreme. Riverdane Ex Rosabel from Mark and Sue Knutsford of Riverdane Holsteins, Middlewich came in at reserve and was shown by Tom Lomas. Being two and a half months fresh, it is giving 45kg and won its milking heifer class at the Western Holstein Spring Show. Out of Riverdane Golden Rosabel, the champion’s great grand-dam was the famed Thurlane James Rose EX97 which won the World Dairy Expo twice. 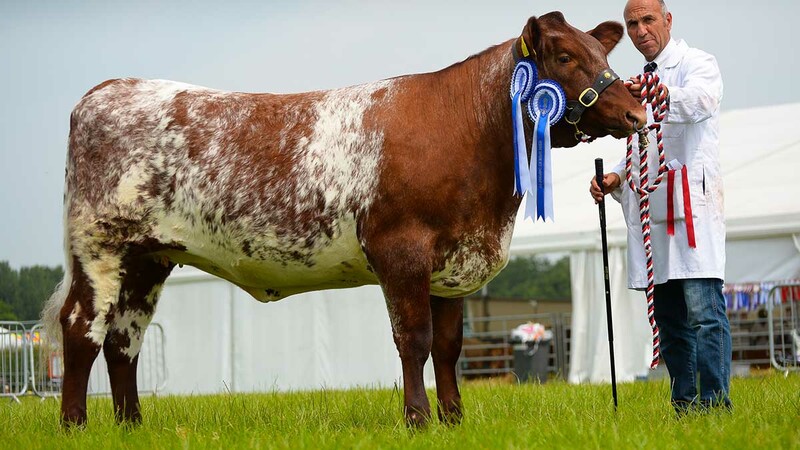 Second-calved three-year-old Dairy Shorthorn champion, Cotonhall Prophet Cherry, Robert Kite, Milwich. Hosting the Dairy Shorthorn national show, the championship went to Robert Kite, Milwich with Cotonhall Prophet Cherry, a second calved three year old. Calved in mid-March, it is now giving 40kg at 4.21 per cent butterfat and 3.39 per cent protein. 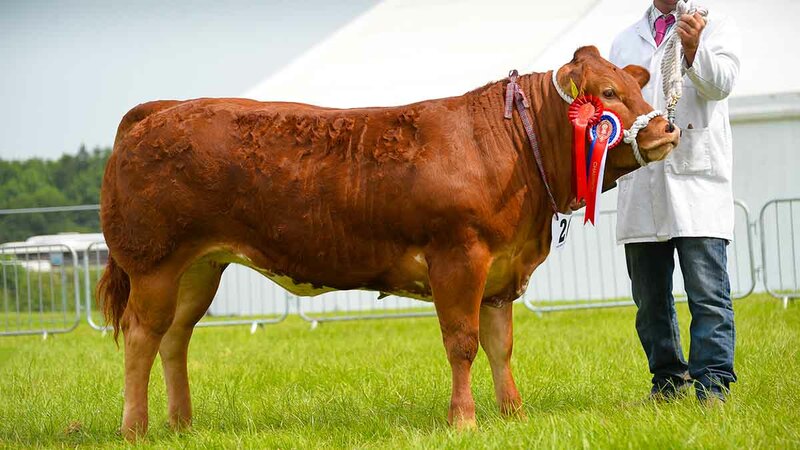 Mr Kite was also reserve champion at Cheshire last year, but with a different animal and more recently was reserve inter-breed champion at this year’s Staffordshire show. 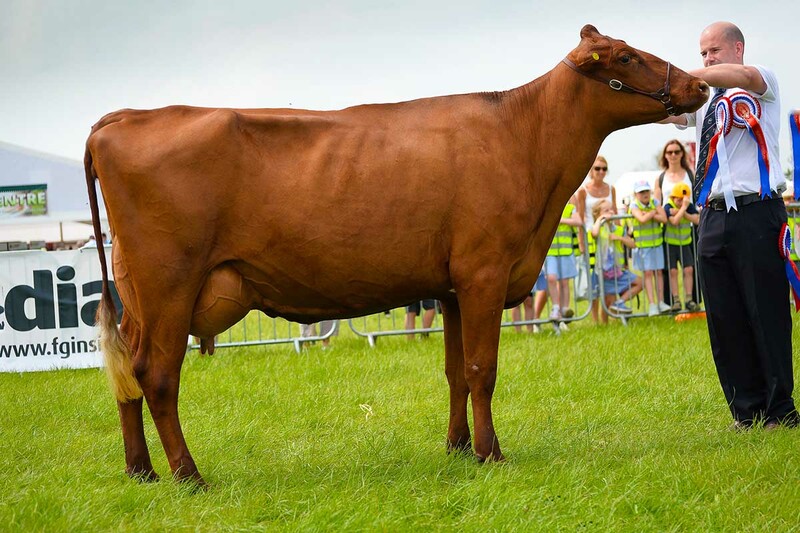 This home bred Llandovery Prophet daughter’s dam, Cotonhall Cherry 4, was honourable mention at the 2013 national show. After a very successful show at the Royal Three Counties, Paul Dawes’ Herefordsire-based Dinmore herd were out in force once again. 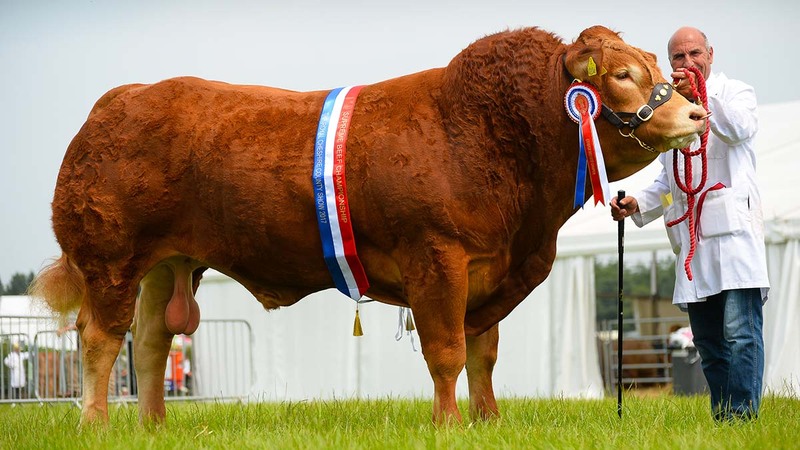 Taking the supreme beef title was an April 2015 born Limousin bull Dinmore Lionheart, the same animal which took both the beef inter-breed and overall champion of champions at Malvern. Having worked all winter at home, 12 heifers are due to calf to him at the back end of this year. By French bull Requin, it is out of Dinmore Caprice and is full brother to Dinmore Jack The Lad, which took the inter-breed at Angus, and Dinmore Jacot which sold to Messrs Ridley in Carlisle last May for 20,000gns. Weighing in at 1,250kg, judge and Welsh TV personality Dai Jones, Llanilar said it had a tremendous weight gain for its age and described it as being correct in all aspects. Reserve supreme beef champion, Dinmore Zoe Katrina, from Paul Dawes, Herefordshire. Reserve supreme was Dinmore Zoe Katrina, another animal from Paul Dawes, this time jointly owned by Richard Bartle and Mary Cormack and of the Beef Shorthorn breed. This home-bred heifer is by Dunsyre Forester and out of Gafton Zoe and is from the Dinmore team’s first ever crop of Shorthorn calves. Its sister was breed champion at last year’s Royal Welsh and first in its class at the Three Counties. Junior beef champion, Dinmore Magdalene, from Paul Dawes, Herefordshire. 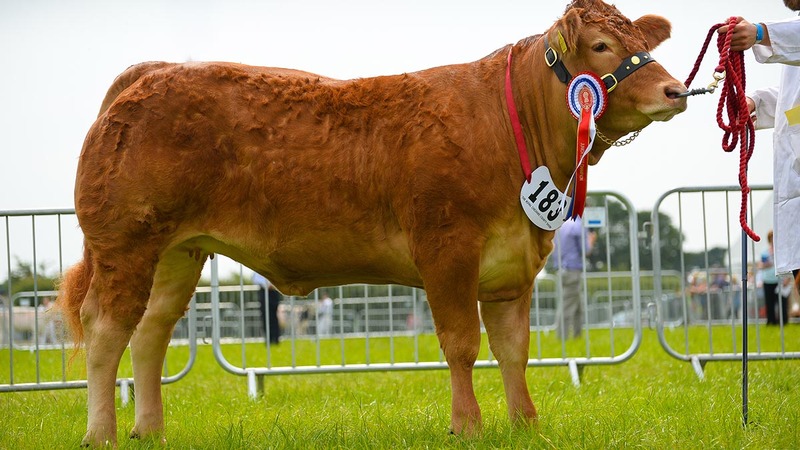 Junior champion was also a Dinmore-bred Limousin, this time Dinmore Magdalene, shown by Thomas Corbett. This heifer was sired by another French bull, Diamant, which was inter-breed champion at the 2014 Royal Welsh and out of Dinmore Galane which has blood going back to Fleethill Sal, another Royal Welsh winner. Commercial champion, Margo, Andrew Dickinson and Lisa Powdrill, Derby. Commercial champion was Margo, a 13 month Limousin cross British Blue heifer from Andrew Dickinson and Lisa Powdrill, Derby. It was purchased at Carlisle in March from Messrs Laird, Ayrshire for £3,300 and was commercial champion recently at Staffordshire and will next go to Derby. Inter-breed sheep champion from Angela and Stan Nairey, Blackburn with a home-bred yearling Texel ewe. In the sheep ring, Angela and Stan Nairey, Blackburn took their first ever Cheshire show sheep inter-breed with a home-bred yearling ewe. By home bred tup Usain Bolt, it is out of a home-bred ewe from the 400-head flock. The Blackburn couple also took the Texel title last year with a yearling ram. 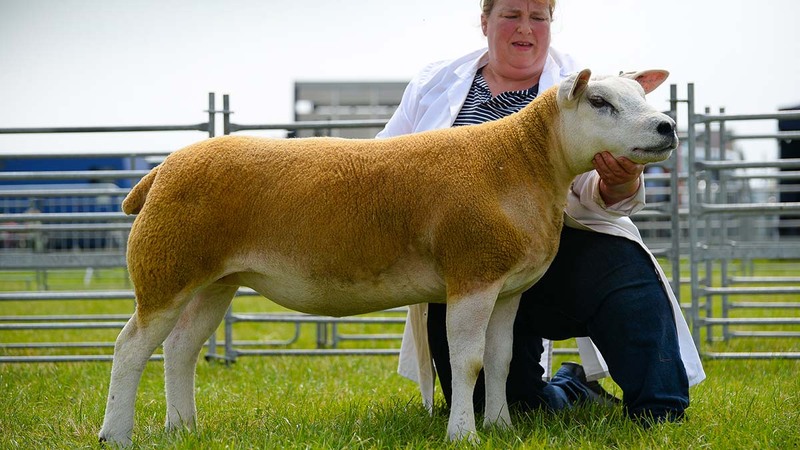 It is the third breed championship of the year for the young ram after also taking top honours at Great Harwood and Todmorden shows and they will now go to the Great Yorkshire to compete. Breconshire judge Carl Gwynne said the Texel handled and stood well. A Hampshire Down yearling ewe from Stephen and Steph Percival, Bakewell. Another yearling ewe, this time a Hampshire Down from Stephen and Steph Percival, Bakewell took the reserve championship. 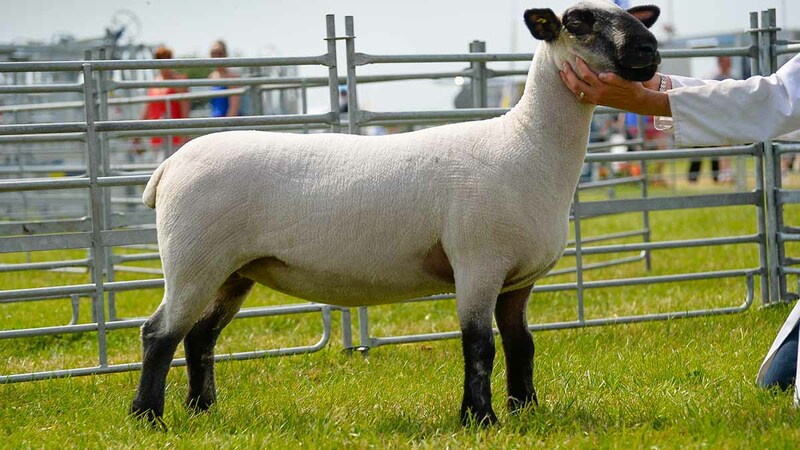 Its dam was purchased in-lamb to a Kelso tup in a private dispersal sale three years ago and was given to Mr Percival to Mrs Percival as a birthday present, the start of what is now the ten ewe Catchadown flock. While shown as a ewe lamb last year, it was reserve native champion at Cheshire and was also reserve interbreed at Leek the same year. Bakewell, Derbyshire County, Leek and Ashover are all in the couple’s calendar for the rest of the year. Mr Gwynne described the reserve as a smart, natural standing sheep which again handled well. Joining these sheep in the final line-up of four was a Roussin aged ram from A.J. Carter, Dawlish and a Charollais yearling ewe from Messrs Madders and Johnson, Hopton. Pig inter-breed champion, Gloucestershire Old Spot sow, Birchfield Bluebell 402 from Sarah Whitley, Harrogate. 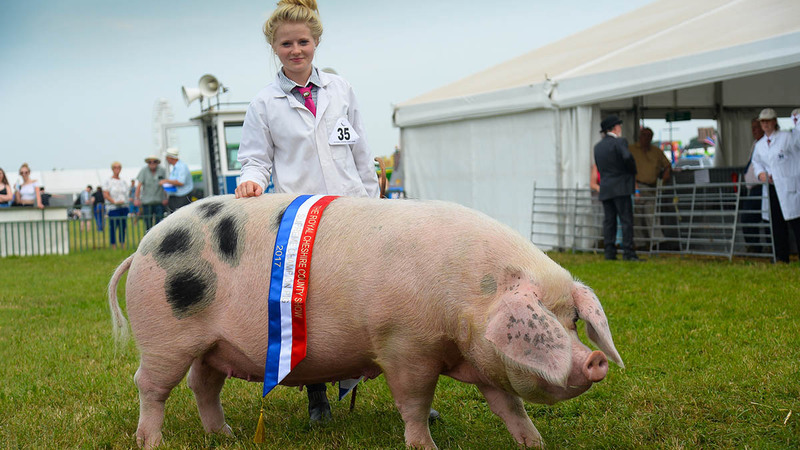 Gloucestershire Old Spot sow, Birchfield Bluebell 402 from 20 year old Sarah Whitley took top honours in the pig ring. Home bred and having had seven litters, it is out of two home bred parents and will next be at the Great Yorkshire and Westmorland. Reserve was Large White sow, Portbredy Maple Leaf 3867, from Teresa Cook, Saxmundham. 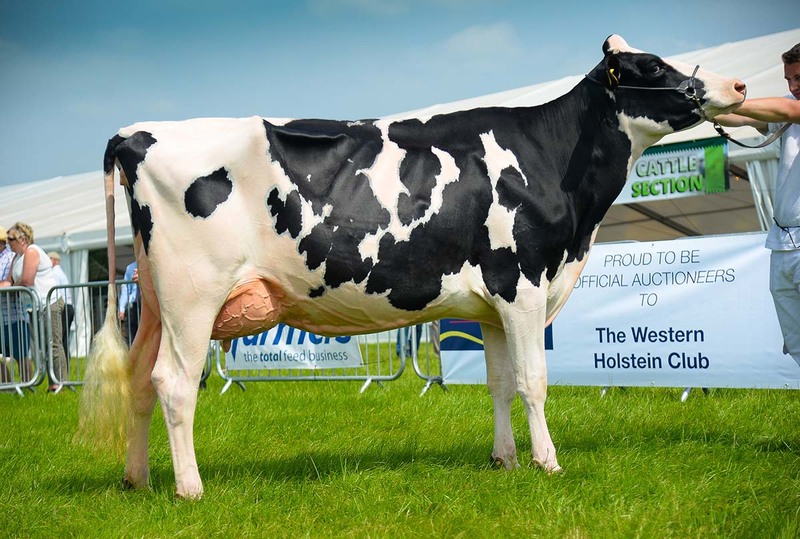 Inter-breed (Alan Timbrell, Gloucestershire) Sup., B. Ford and J. Hudson, Rapidbay UK Jades Belladonna (Jersey); res., Riverdane Holsteins, Riverdane Ex Rosabel (Holstein). Dairy Shorthorn (J. Robinson, Cumbria) Sup., Robert Kite, Cotonhall Prophet Cherry; res., R. Crank and sons, Avondale V I 5. Ayrshire (S.N. Bailey, Cheshire) Sup., Oultram and co, Western 44; res., Oultram and co, Lady Marina. Holstein (K. Proctor, Norfolk) Sup., Riverdane Holsteins, Riverdane Ex Rosabel; res., R.J. Clare and partners, Hawksmoor Regina. Jersey (A. Wilson, Dyfed) Sup., B. Ford and J. Hudson, Rapidbay UK Jades Belladonna; res., B. Ford and J. Hudson, Honeyfields O Belladonna. Brown Swiss (M. Williamson, Cumbria) Sup., Farrick Farms, Pasturelands Brittania; res., M. and S. Williams, Elite Blooming Mair. Inter-breed (D. Jones, Ceredigion) Sup., Paul Dawes, Dinmore Lionheart (Limousin); res., Paul Dawes, Dinmore Zoe Katrina (Beef Shorthorn). Hereford (W.T. Livesey, Leicestershire) Sup. and fem., R. and R.I. Shaw, Hallwood 1 Sapphire; res., R. and R.I. Shaw, Halwood 1 Ruby; male, E.A. and A. Jones, Rempstone 1 Mines-a-Double. Limousin (N. Vance, Shropshire) Sup. and male, Paul Dawes, Dinmore Lionheart; res. and fem., Paul Dawes, Cowporation Lagrazia; res. male, Paul Dawes, Dinmore Magnus; res. fem., Paul Dawes, Dinmore Jestelle. Simmental (D.M. Donnelly, Derbyshire) Sup. and fem., Thomas Hassall, Fishpool Galaxy; res. and male, S. White, Tirley Heathcroft; res. fem., Thomas Hassall, Mosshall Emily. Charolais (D. Pawson, Lancashire) Sup., H.G. and J. Evans, Congress Faberge; res., Ian Hollinshead, Allostock Lemar. British Blue (J. Courts, North Yorkshire) Sup. and fem., John Okell, Cromwell Jell Baby; res. and res. fem., Madders and Johnson, Ingestre Keira; male, Nigel Pritchard, Norton Knight Rider; res. male, P.J. and H.L. Brindley, Blue Mist Kynsley. Aberdeen Angus (B.J. McClintock, Cheshire) Sup., Chris Huxley, Hallington Emperor R478. British Blonde (R. Kinnish, Shropshire) Sup., Ian Richardson, Warmingham Lucy; res., Tim Owen, Bickley Guiness. Longhorn (G. Green, Leicestershire) Sup., Brian Wragg, Lower Blacup Nancy; res., Brian Wragg, Lower Blacup Patrica. South Devon (M. Kettlewell, Oxfordshire) Sup., Richard Hartshorn, A Cilgwrrwg Sas Zoom; res., Roden Livestock, Z Eyton SAS Leo 1. Commercial (C. Phillips, Hereford) Sup., Andrew Dickinson, Marog; res., Whitfield and Ryan, Black Beauty. Any other native (J. Bebbington, Denbighshire) Sup., Paul Dawes, Dinmore Zoe Katrina (Beef Shorthorn); res., Paul Dawes, Dinmore Zoe Kryptonite (Beef Shorthorn). Any other continental (J. Bebbington) Sup., David Plumbley, Ashrose Elizabeth 34 (Murray Grey); res., David Plumbley, Ashrose Elizabeth 17 (Murray Grey). Red Poll (D.C. Blunt. Buckinghamshire) Sup., Helen Arthan, Chorlton Lane Fella; res., Alan Bickerton, Pear Tree Ruby. Dexter (A. Park, Wiltshire) Sup., Pam Weaver, Mercer Sunflower; res., Candy Kingg, Needles Hall Agapanthus. Any other dual purpose (J.W. Brigg, Warwickshire) Sup., Elayna Astbury (British White), Cadarn Welsh Dragon; res., D. and E. Price Jones, Littleton Adeline 3 (Gloucester). Inter-breed (C. Gwynne, Powys) Sup., F. A. Nairey (Texel); res., Stephen Percival (Hampshire Down). Charollais (N. Hart, Herefordshire) Sup., Madders and Johnson; res., G. Biddulph. Jacob (G. Jones, Hampshire) Sup., Clive Richardson; res., G. and S. Wood. Suffolk (J. Airey, Cumbria) Sup. and res., James Richmond. Texel (A. Minnice-Hughes, Powys) Sup., F. A. Nairey; res., F. Rushton. Shropshire (A. Oliver, South Yorkshire) Sup., A. Harvey; res., M. and S. Shimwell. Beltex (J. Hall, Cumbria) Sup., Dermot Costelloe; res., Judith Bevan. Any other continental (B. Stayt, Gloucestershire) Sup., A.J. Carter (Roussin); res., Oscar Crossen (Zwartbles). Any other native (B. Stayt, Gloucestershire) Sup. and res., Stephen Percival (Hampshire Down). Butchers lambs (N.A. Davenport) Sup., S.R. Taylor; res., J. Barlow. Inter-breed (A.P. Rose, Somerset) Sup., Sarah Whitley, Birchfield Bluebell 402; res., Teresa Cook, Portbredy Maple Leaf 3867. British Saddleback (A.R. Gready, East Lothian) Sup., J. and A. Newth, Prestcombe Golden Arrow 25; res., J. and A. Newth, Prestcombe Dinah 84. Gloucestershire Old Spot (A.R. Gready) Sup., Sarah Whitley, Birchfield Bluebell 402; res., Sarah Whitley, Birchfield Dolly 1043. Large Black (A.R. Gready) Sup., Richardson and Wood, Mariposa Dorothy 4; res., Jack Holroyd, Addison Matilda. Middle White (A.R. Gready) Sup., Paddock and Marsden, Eaves Captain 5; res., Paddock and Marsden, Michael and Sarah. Any other traditional (A.R. Gready) Sup., Ian Lawrence, Longash Gloria 7 (Oxford Sandy and Black); res., Ian Lawrence, Oldland Clare 25 (Oxford Sandy and Black). Duroc (C. Impey, Mid Glamorgan) Sup., A. and J. Walton, Deva Thunder 1230; res., A. and J. Walton, Deva Nancy 914. Large White (C. Impey) Sup., Teresa Cook, Portbredy Maple Leaf 3867; res., S.J. and A.L. Booth, Chapel Champion Lady 7. Pietrain (C. Impey) Sup., J. and A. Newth, Prestcombe Paperasse; res., J. and A. Newth, Prestcombe Merry 2. Welsh (C. Impey) Sup., Geoff Bemand, Letsterspring Julia 13; res., Geoff Bemand, Leysterspring Willing 7. Any other modern (C. Impey) Sup., Grace Bretherton, Hedgerow Inga 43; res., Richardson and Wood, Arthen Erorm.